Texas Tech University Health Sciences Center El Paso’s medical education program has been granted full accreditation for eight years without citations by the Liaison Committee on Medical Education (LCME), the best possible outcome of an application for continuing accreditation. Clinical integration is key to the PLFSOM’s curriculum. Unlike many traditional medical schools, PLFSOM students are immersed in diagnostic reasoning and clinical skill-building from the very start of their medical education. They learn the scientific foundations of medicine and related diagnostic skills based on common clinical presentations throughout the first and second years. During this phase they also participate in community explorations and assessments, as well as a unique program of fully integrated Spanish language instruction. From the first day of medical school, PLFSOM students are taught to think like a doctor. 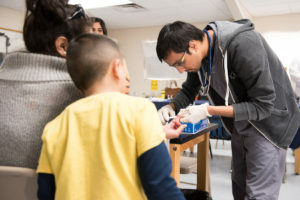 Active learning is encouraged through simulation exercises in the school’s Center for Advanced Teaching and Assessment in Clinical Simulation. ATACS uses high-fidelity manikins that simulate everything from cardiac arrest to a vaginal birth. Students also interact with “standardized patients,” real people trained to act out symptoms of medical conditions. These simulation activities help students learn to recognize conditions while developing their people skills and bedside manner. The PLFSOM’s LCME accreditation is the third accreditation to be awarded to TTUHSC El Paso in 2018. Previously accredited under Texas Tech University Health Sciences Center in Lubbock, TTUHSC El Paso was granted separate institutional accreditation by the Southern Association of Colleges and Schools Commission on Colleges in June. Also in June, the Gayle Greve Hunt School of Nursing earned its 10-year programmatic accreditation by the Commission on Collegiate Nursing Education (CCNE). More information about the Paul L. Foster School of Medicine may be found at elpaso.ttuhsc.edu/som.